Acquisition History: The Garland Pond WMA was acquired from 1990-1992 in part through donations to the New Hampshire Fish and Game Department by the Werdin and Winkley families. State duck stamp revenues were used to purchase the remainder of the property. 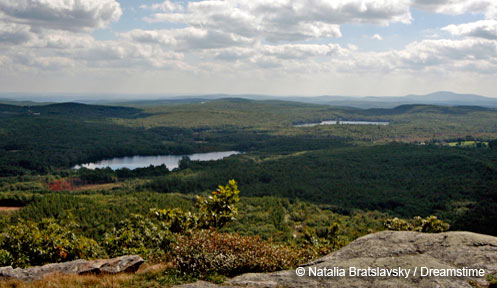 The WMA is 107 acres and is a combination of fee simple and conservation easement lands. Description: Garland Pond WMA is made up of wet meadows, separated by a tributary to the Beech River. A small upland wooded area lies along the western edge of the property. The water in the 30 acre Garland Pond is maintained by an old dam, originally constructed in the late 1700’s as a gristmill, later maintained by beaver. A small access site for canoes and other car top watercraft can be found on the north side of the pond near the dam site. Common Wildlife: Garland Pond supports a variety of waterfowl such as Canada geese, mallards, black ducks, wood ducks, hooded mergansers, and ring-necked ducks. Other common wildlife include beaver, otter, muskrats, and a variety of wetland birds. Directions: The property can be accessed by heading east on Durgin Rd off of Route 171 in Tuftonburo. At the Tuftonburo-Ossipee town line the road changes to Chickville Road. The canoe access is a little more than half a mile east of the Tuftonboro town line.